GearWrench 1/4'', 3/8'' and 1/2'' drive universal adapter 10 piece set. GearWrench 1/4'', 3/8'' and 1/2'' drive magnetic universal joint 3 piece set. GearWrench 1/4'', 3/8'' and 1/2'' drive hex and Torx bit 36 piece set. GearWrench 1/4'', 3/8'' and 1/2'' drive Torx bit 13 piece set. GearWrench 1/4'', 3/8'' and 1/2'' drive Torx tamper proof bit 13 piece set . GearWrench 1/4'', 3/8'' and 1/2'' drive external Torx 13 piece set. GearWrench 3/8'' drive tamper proof bit Torx 11 piece set. GearWrench 1/4'' and 3/8'' drive long Torx bit 10 piece set. GearWrench 1/4'', 3/8'' and 1/2'' drive external Torx bit 10 piece set. GearWrench 3/8'' and 1/2'' drive hex bit 10 piece set. GearWrench 3/8'' and 1/2'' drive metric hex bit 10 piece set. GearWrench 3/8'' and 1/2'' drive metric triple square bit 3 piece set. 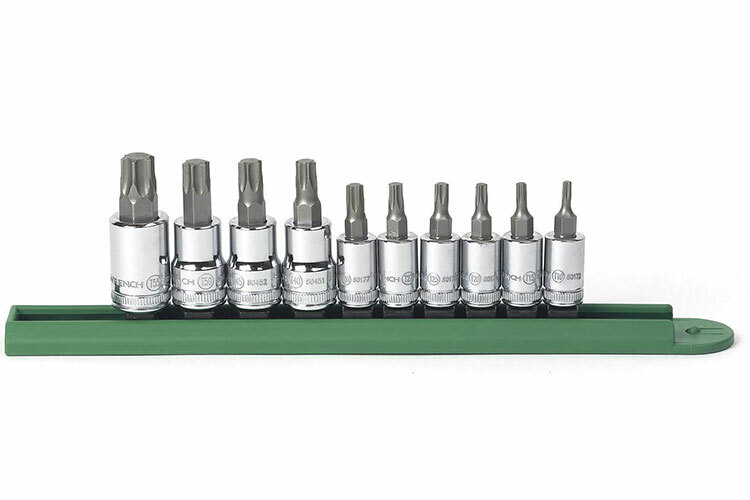 The 80722 GearWrench 1/4'' and 3/8'' Drive Torx Bit Socket 10 Piece Set is one of thousands of quality tooling products available from MRO Tools. Please browse GearWrench Multidrive Socket Sets for tools similar to the 80722 GearWrench 1/4'' and 3/8'' Drive Torx Bit Socket 10 Piece Set. 80722 GearWrench 1/4'' and 3/8'' Drive Torx Bit Socket 10 Piece Set description summary: GearWrench 1/4'' and 3/8'' drive bit Torx 10 piece set. 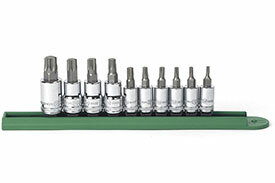 Quantity discounts may be available for the 80722 GearWrench 1/4'' and 3/8'' Drive Torx Bit Socket 10 Piece Set. Please contact MRO Tools for details.